A copper alloy medieval strap slide dating to the period c. AD 1300 - 1400. The strap slide consists of a rectangular frame with one side expanded out into a six-sided lenticular shape. This slide is slightly convex and has an incised groove running around the edge of create a border. There are incised parallel lines visible on several of the surfaces of the strap slide which may be tool marks. 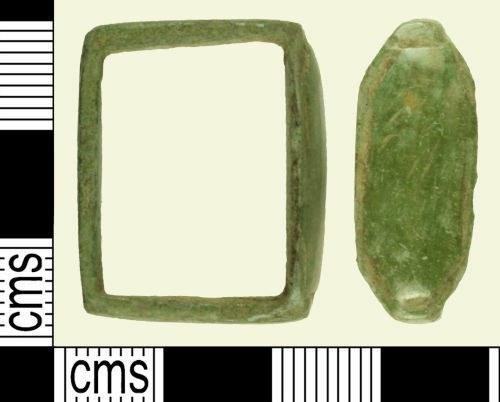 The object has a dark green shiny patina. The strap slide measures 24.84mm in length, 9.81mm maximum width, 3.32mm minimum width and weighs 5.73g.